Caseen Gaines might be the coolest high school English teacher around. 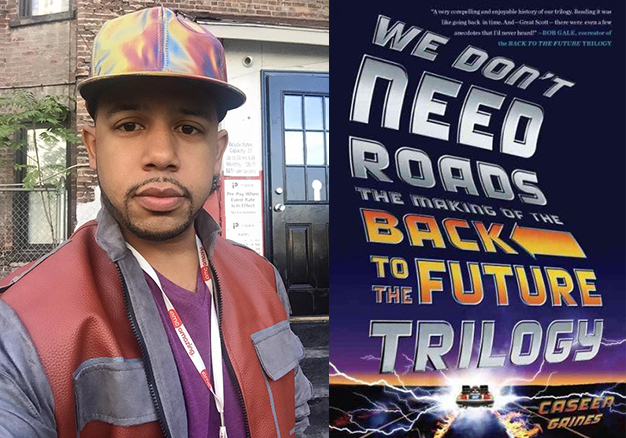 Having already written books on A Christmas Story and Pee Wee’s Playhouse, his third book, We Don’t Need Roads, focusing on the making of the Back to The Future trilogy arrived was released this past summer. The writer and fellow pop-culturalist wrote his senior thesis on race relations in the original Planet of the Apes film series. With today officially representing “the future”, Caseen took some time to answer some questions about the book and his density. FOG! : Your first experience with the Back to The Future trilogy was a triple feature on home video, never experiencing that several year wait that the first wave of viewers saw when the original was first released. What was the experience like, seeing the trilogy for the first time and did the immediate viewing of Parts II & III alter your experience of the first film? Caseen Gaines: Experiencing Back to the Future for the first time in a triple was a truly amazing experience. I know a lot of people had issues with Part II in the theaters, because the ending is a cliffhanger and the story is left unresolved, but I’m fortunate enough to have never had that experience. I got to experience Marty’s trajectory from skateboards, to hoverboard, to horses all a six hour sitting. Like all Back to the Future fans, I’ve been waiting for 2015 since I first saw the films. As this year approached, I was really interested in telling a comprehensive story about the making of the films. The trilogy is well documented, but even with all the information that was already out there, I still had lots of questions. The story behind the making of these films has always fascinated me — from the recasting of Eric Stoltz and Crispin Glover’s characters, to the insane post-production schedule, to the hoverboard incident on the set of Part II where a stuntwoman nearly died. I felt there were still fresh stories to tell, and I set out to do that. In your introduction you mention your hesitancy to call director Robert Zemeckis. What was the experience like speaking to him for the first time? Robert Zemeckis, truly, is a directorial hero of mine. Forrest Gump, Who Framed Roger Rabbit, and, obviously, the Back to The Future trilogy, are among some of my favorite films. Having a chance to pick his brain about his filmmaking process was an amazing experience. He has such incredible insight about the differences between filmmaking in the 1980s and today. I was glad we were able to get some of that into the book. Co-writer Bob Gale seems so much more approachable and enthusiastic to discuss the films. Are his memories and those of Zemeckis in sync? Asking anyone to remember specific details about what happened thirty years ago is a difficult thing, so there were some inconsistencies between all of their memories, but luckily Bob Gale keeps amazing records and often was able help corroborate stories. Before we published, I asked Bob to read through the book to check for its accuracy. Getting is stamp of approval was a really fantastic feeling. He truly was a major asset during the writing process. There are several noticeable interviewees absent from the book including Michael J. Fox, Steven Spielberg, Tom Wilson, Crispin Glover and Eric Stoltz. Who’s participation would have made the book that much richer? I made several attempts to reach out to Eric Stoltz and Crispin Glover and wish I could have had their participation for the book. I understand the reasons why they didn’t choose to. However, they are featured so heavily in the book that I wanted to make sure they had a chance to weigh in on the anecdotes I wrote about. Luckily, I was able to speak with enough people who had nice things to say about Eric and Crispin where I feel they were represented with fairness in the book. What about the series do you think resonates with audiences and why do you think that it continues to resonate with new viewers? Back to The Future, at its core, is a movie centered around an ingenious idea with a lot of heart. Having a teenager go back in time and meet his parents is such a brilliant and simple idea — it’s truly amazing no one had thought of it earlier! The writing is rock solid, especially in the first film, and all the performances are stellar. Back to the Future captured everyone’s imaginations on July 3, 1985 and that hasn’t subsided over the thirty years that followed. What’s your next upcoming project? How are you spending October 21, 2015? I will be in Los Angeles attending the We’re Going Back convention! I plan on either watching Back to the Future Part II at Universal Studios or watching the complete trilogy at the Puente Hills Mall, where the filmed the scene where the DeLorean first travels through time. Either way, I’ll be surrounded by lots of fellow Back to the Future fans, which is just where I want to be! is available now in stores and online. Traded Up: A Look at a Trilogy of Untold 'Back To The Future' Tales!